We are now in the home stretch of the build with the interior beginning to take shape! No matter how much you plan, measure, and visualize in advance the build remains a fluid process. With insulation and the walls in place I had several inches less lateral room than I initially anticipated, which led to some last minute changes in design. 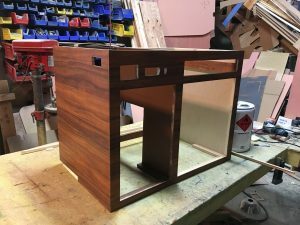 However, being flexible and able to make small changes throughout the build has also given me the opportunity to add small details to really optimize the form and function of the layout. With the final wiring and plumbing going in I thought I would take a moment to discuss appliances and kitchen layout. First off, I’m not a big fan of cooking inside my van, so I don’t have a stove or onboard propane. In my opinion, once you start cooking and heating your van you are too far removed from the environment outside. I have never had an issue setting up my portable grill outdoors and prefer cooking that way. Onboard water storage, however, is critically important for exploring. I decided to place the water tank under the rear bench seat in a “dead zone” of storage that is hard to access otherwise. The max tank I could fit in the space is 18 gallons which is acceptable. I would have liked a bit more for extra long trips but I can always carry jerry cans if needed. 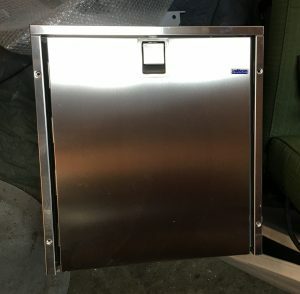 I also installed a 6 gallon gray water tank under the floor which fit perfectly between the battery box and frame rails. Lastly, I chose an Isotherm Cruise marine refrigerator after reading rave reviews for its power efficiency. With 320 amp-hours of battery and a 160 watt solar panel I should be good for multiple weeks completely off-grid. Baja here I come! One concern I had after seeing the initial cabinet mock up was how the finished dark koa wood would look compared to the light bamboo on the floor. I wanted both koa and bamboo woods to keep with the island theme of the build, so I chose the lightest bamboo available. But would they clash? 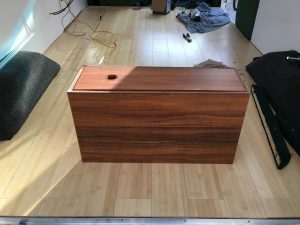 Is 2 different woods too much? 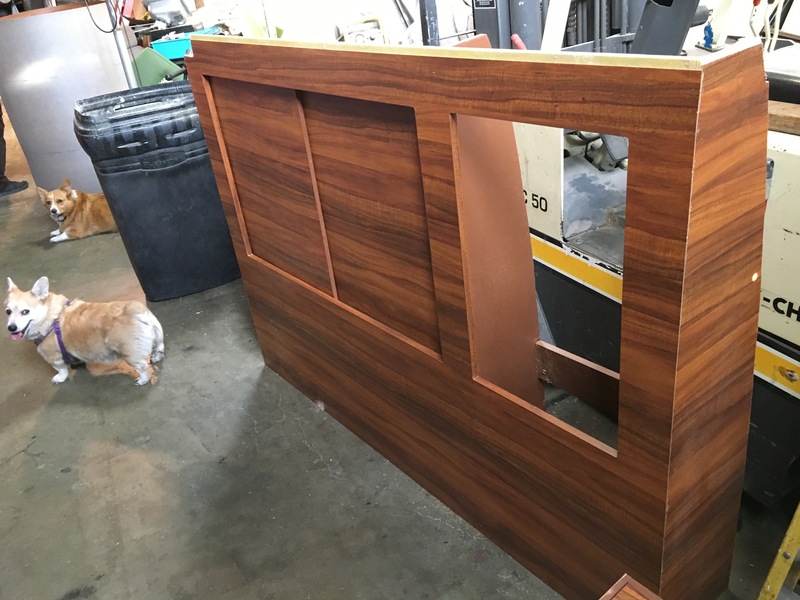 After seeing the first completed cabinets I was quickly relieved to find that the koa and bamboo compliment each other warmly. 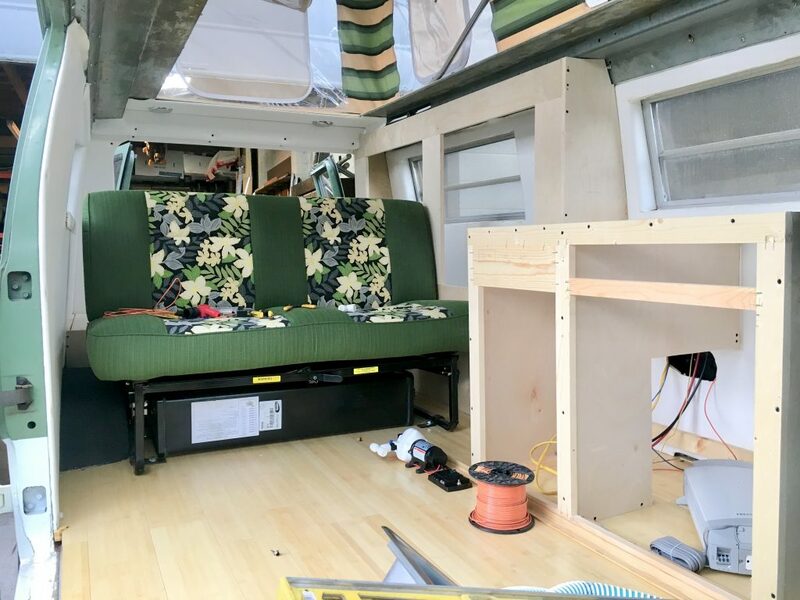 There will be a lot of textures and colors on the interior but that works with both the fun spirit and retro style of the van. I did not want to hold back and had a ton of fun designing the interior. The general cabinet layout is very similar to the Sportsmobile RB50 design. 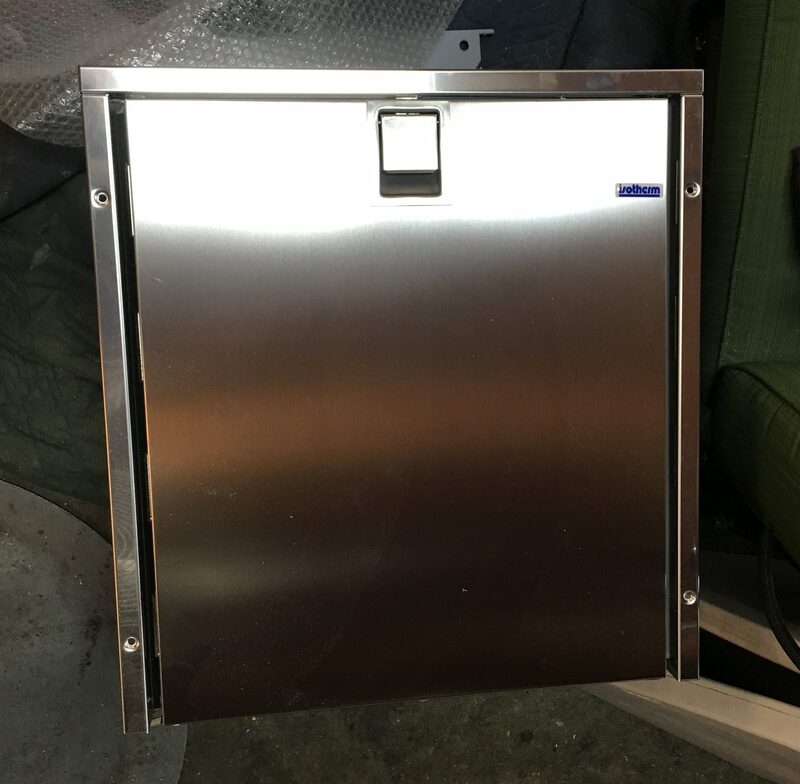 The fridge and sink will sit behind the drivers seat with a bar attached to one of the side barn doors. 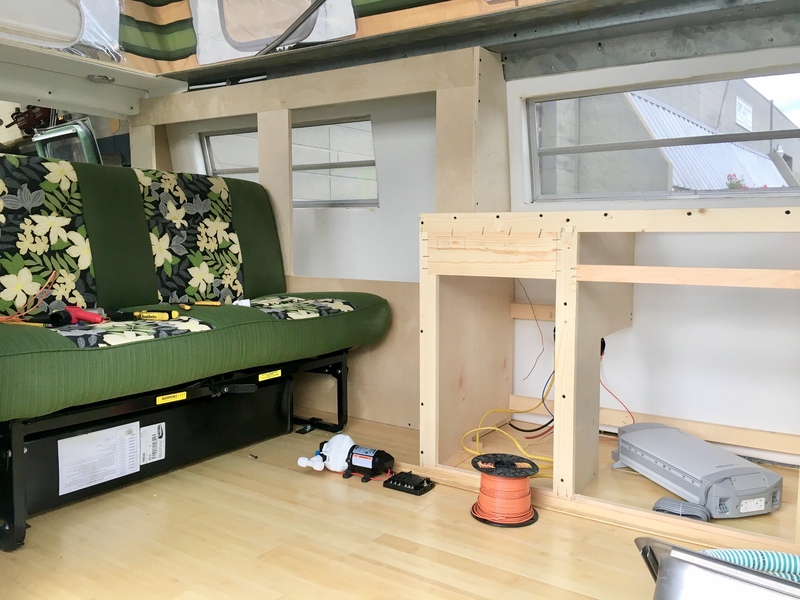 A massive storage cabinet will take up the space next to the bench seat with shelves and sliding doors. This cabinet will cover one of the rear windows but I felt that was an acceptable compromise to optimize storage. 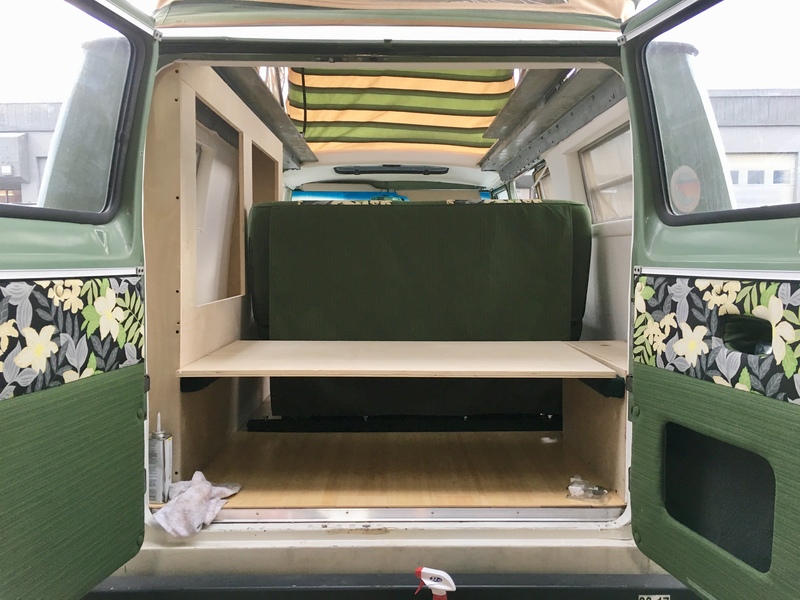 A seating platform in the rear will complete the lower bed with a bed platform up top as well. With the cabinets close to complete the next few weeks will focus on the installation along with final trim. I expect to have it wrapped up before the Christmas holiday and you can bet the first thing I will do is take it out for a trip! The corgi’s are certainly excited and I am too! Beautiful work my friend! It’s looking terrific. I love it! Reminds me of my 1978 F-150 and my 1998 Dodge. You Guys will love cruzin in this .